Six Tools proven to help you create more Life Balance this week. Life balance doesn't just happen. You build it one week at a time. Here are the tools to take your life back. Learn the Schedule HACK process and build the balance you are looking for into each week. This process works every time you use it for you and your family. Keep the 400 pound Gorilla that is your career at bay - Learn the Schedule HACK here. It is just a two letter word that starts with an "N". We know you don't say it very often -- most doctors don't -- AND it is the secret to life balance. 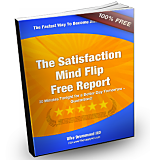 Learn 3 steps to saying "No" with Elegance and Grace at this link. 3) To get the most from your time off ... you must come all the way home. Have you ever found yourself in this situation ... you are sitting at home, thinking about ................ work??! Just asking that question is a little silly isn't it? Unfortunately, you can't begin to recharge until you come all the way home. If you are thinking about work from your living room couch, your are just continuing to drain energy in a new location. 4) How to get the most out of every day off and every vacation break. A quality day off or vacation is a work of art. There are a series of steps you have to take to make your time away from work an authentic break from the whirlwind. Here are some simple powerful tools that will help. Most physicians beat themselves up with their Bucket List. Instead of living your list you focus on the frustration of never being able to tick one off. Let us show you how to prune your list to the really important items and then start living them. Our mini-training "Bucket List - 3 steps to living yours" will show you how. 6) How's your love life? Your primary relationship is - ideally - a source of strength and a connection to passion. Doesn't always work out that way for doctors though. You have to plan and schedule passion and connection and quality time - or not. Your choices will determine your quality of life either way. Learn some solid tips in this post "Date Night Secrets"
The first field manual to lower stress, more life balance and a more Ideal Practice. 20,000 copies in print. 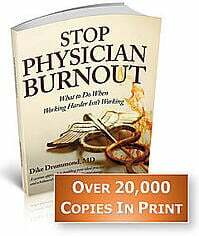 Over 117 ways to prevent physician burnout inside. 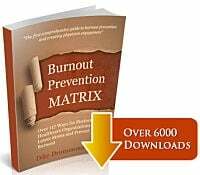 All you need is 3 - 5 in your prevention strategy.